Periodontal Disease Treatment - A patient friendly treatment of periodontal disease using the latest technology. 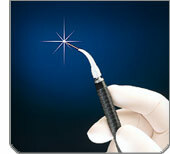 Laser Softcare™ can help eliminate infection and heal diseased gums which otherwise could lead to early tooth loss. Then, a small amount of light energy from a laser is directed through a tiny fiber, which is gently placed between the gum and tooth. This light energy aids in reducing the bacteria associated with the disease. After the area is thoroughly cleaned, the body can heal the area naturally.